Ryland was born in 2015 in Wyoming. He was life flighted to the NICU in Denver Colorado, it was there that he was diagnosed with Arthrogryposis Multiplex Congenita or AMC and severe scoliosis. AMC is a non-progressive congenital disorder that often has no ideology as to why it occurs. Babies born with AMC are affected in multiple joints and limbs. Ryland is affected in his wrists and arms his spine and his hips and legs he was also born with clubfeet. After discharge from the NICU Ryland began an extensive travel regimen to see Orthopedic specialists. There were no treatment options for Ryland in Wyoming as nobody had ever heard of AMC and so we traveled first to specialist in Colorado and then deciding to seek out more specialized treatment in Salt Lake City Utah. During his first year of life Ryland underwent numerous appointments for splinting on his wrists and hands to treat his joint contractures and upon his first visit to Salt Lake we began weekly casting of his clubfeet. Ryland underwent 17 sets of casts and during that first year we traveled 26 trips to Salt Lake. Due to his need for extensive orthopedic care we relocated from Wyoming to Salt Lake City. During our time there, Ryland was fitted with an electric wheelchair and went through weekly physical therapy treatments. As Ryland grew it was apparent that his hips were not bending the way they needed to for him to be able to sit or even walk. We began talking to his doctor about treatment options to help him sit and were very discouraged with our options. In November of 2017 we were told that our only option was to wait until Ryland was 12 years old and then we would have to decide between Ryland being able to walk or able to sit but that he wouldn’t be able to have both. At this point, Ryland couldn’t even sit in a car seat safely or for more than 45 minutes without becoming very uncomfortable and being in pain. We have a very dear friend whose little girl had surgery with Dr. David Feldman at Paley Institute in West Palm Beach and she encouraged us to bring Ryland for a second opinion. We scheduled his appointment for February 2018. This appointment changed his whole life! We weren’t given hurry up and wait we were given HOPE and an extensive treatment plan not only for Ryland’s hips but also for his spine and his upper extremities. His first surgery on his hips and femurs would require at least a 6-week stay in Florida and then eventually spine surgery while he is still young, and we knew as a family that we couldn’t travel back and forth with our teenagers still at home in Utah, so we decided to relocate to Florida. 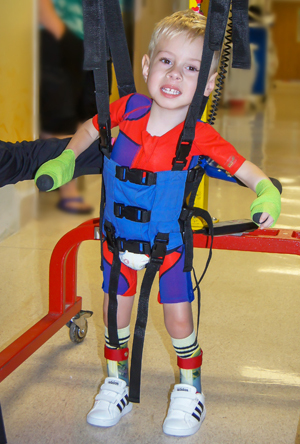 Ryland had his first surgery with Dr. David Feldman in July and since then he is walking with a walker and he can sit for the first time in his life! Without Paley Institute and the amazing doctors willing to try my amazing son would still be floor bound and unable to travel in a car comfortably or participate upright in his world! He is making amazing strides and growing every day. He still has numerous surgeries coming in his life and lots of hard work ahead of him but with our amazing Dr. F as Ryland affectionately calls him and our amazing therapy team at Paley Institute we can now see independence and freedom in Ryland’s future and that means everything to us!